The original first look photos from Elysium, the new sci-fi, sophomore effort from District 9 director Neill Blomkamp, already introduced us to Matt Damon with some sort of biotech on his body, not to mention seeing our first look at Sharlto Copley and Alice Braga in the film. Now promotion for the release this August is in full swing as the first poster has arrived. It's simple and just gives us a different angle on Damon in his weird sci-fi gear, like some kind of crazy, futuristic Jason Bourne. Stay tuned for our reaction to footage from the film shown around the world today and see the first trailer out now. Full poster below! In the year 2159 two classes of people exist: the very wealthy who live on a pristine man-made space station called Elysium, and the rest, who live on an overpopulated, ruined Earth. 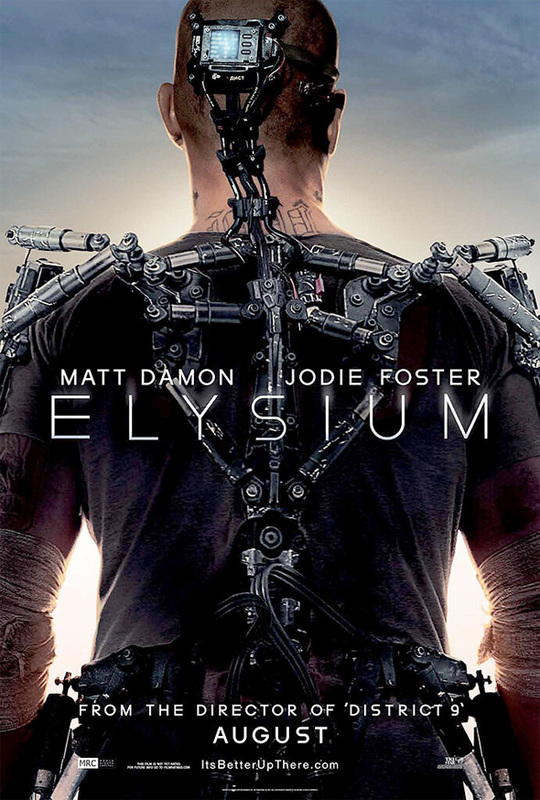 Secretary Rhodes (Jodie Foster), a hard the government ofﬁcial, will stop at nothing to enforce anti-immigration laws and preserve the luxurious lifestyle of the citizens of Elysium. That doesn’t stop the people of Earth from trying to get in, by any means they can. When unlucky Max (Matt Damon) is backed into a corner, he agrees to take on a daunting mission that if successful will not only save his life, but could bring equality to these polarized worlds. Neill Blomkamp writes/directs Elyisum and Sony will release the film on August 9th this summer. Raves are popping up on twitter. They showed 10 minutes of the film. How can you NOT get excited for this??? District 9 was smart, fun and of all things, innovative. Basically everything that Ridley scott was and is not anymore. I know this movie will be good. Period.